The first flying prototype of Russia’s new Irkut MC-21 narrowbody airliner will not be displayed at the country’s primary aerospace exhibition MAKS this July. 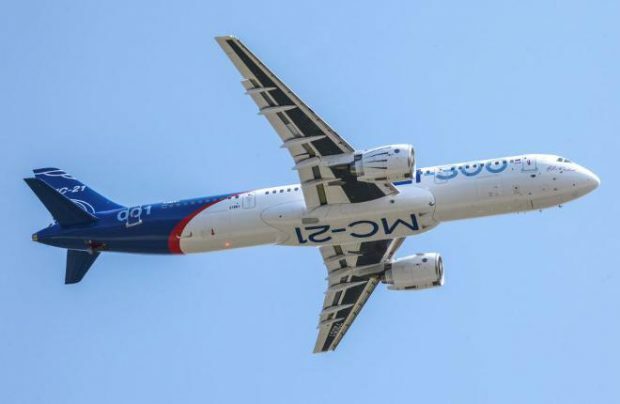 Irkut President Oleg Demchenko told journalists at the Paris Air Show that the aircraft will only have completed factory tests in Irkutsk, Siberia in September this year. This phase will involve between 30 and 40 flights. After that the prototype will be ferried to Zhukovsky, outside Moscow, for certification testing. Demchenko confirmed previous reports that Russian certification of the baseline version, the MC-21-300 (whose prototype is currently undergoing the flight tests), is expected in 2019, to be followed by EASA certification in 2020. In a separate development, France’s Safran Group has announced it will provide a ventilation system for the MC-21. An agreement to that effect was signed with Irkut at the Paris Air Show. The system, to be designed by the French corporation’s subsidiary Safran Ventilation Systems, will comprise eight pieces of equipment. It will provide air conditioning for the passenger cabin and the avionics bay. Safran will be providing aftersales support for the system once the MC-21 has hit the market. As previously reported, the original plan called for fitting the new Russian airliner with a Russian-made ventilation system. NPO Nauka was initially selected as the supplier, but the company failed to meet the required weight and economy parameters. The system integrator role was then reassigned to PKO Teploobmennik, resulting in certain structural changes to the airframe. The MC-21-300 prototype first flew on May 28. Four more test flights have been performed to date. The latest one, on June 21, tested the aircraft’s wing high-lift devices in all flight configurations.